Israel has freed a group of 26 Palestinian prisoners as part of a US-brokered agreement to resume direct peace talks. The prisoners were greeted by cheering crowds on their return to the West Bank and Gaza. Israel approved the releases on Saturday, but they were delayed to allow victims’ families to appeal. The prisoners committed murder or attempted murder before the 1993 Oslo accords and have served 19 to 28 years. They make up the third tranche of a total of 104 prisoners to be freed. Eight of the men were driven late at night to checkpoints leading into Gaza and East Jerusalem. The other 18 prisoners were heading to Ramallah in the West Bank. Palestinian President Mahmoud Abbas greeted the prisoners at his headquarters in Ramallah and pledged to continue pressing for the release of other long-serving and sick prisoners. “We will not sign a final peace deal with Israel before all the prisoners are released,” he said. 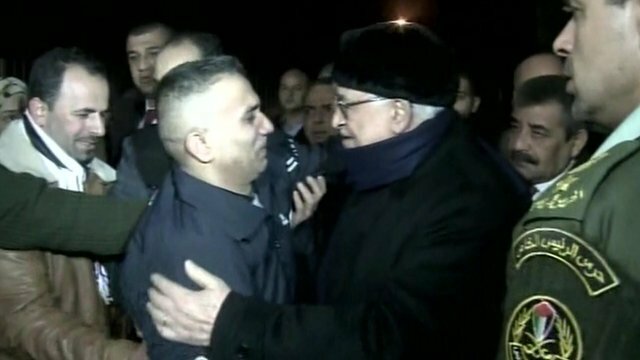 President Mahmoud Abbas has previously hailed the prisoners as heroes of the Palestinian cause. Palestinians celebrate the releases as victories over Israel – something deeply resented by families of Israeli victims of political violence. Relatives of the victims of the latest prisoners being freed – 18 from the West Bank, three from Gaza and five from East Jerusalem – have staged days of protests against the releases and appealed to the Supreme Court to block them. In the past, the court has allowed such releases to take place. “One of the things we knew when we captured these detainees is that they needed to stay in prison for the maximum period,” Meir Indor of Israeli victims’ association, Almagor, told the Jerusalem Post. The Israeli government has stressed that if any of the prisoners “resume hostile activity” they will have to serve the remainder of their sentences. PM Benjamin Netanyahu also defended the decision to free those behind deadly attacks at a meeting of his Likud party on Monday. “Leadership is judged by the ability to implement decisions, difficult as they may be,” he said. After the two previous releases, the Israeli government has sugared what the right-wing parties within its coalition regard as a bitter pill by making announcements about Jewish settlement plans in the occupied West Bank. Israeli media reports suggest Benjamin Netanyahu is likely to unveil plans to build an additional 1,400 housing units, including 600 at Ramat Shlomo in East Jerusalem. About 500,000 Jews live in more than 100 settlements built since Israel’s 1967 occupation of the West Bank and East Jerusalem. The settlements are considered illegal under international law, though Israel disputes this. Palestinians say continued settlement construction undermines the direct peace talks, which have shown little sign of progress since resuming in July after a three-year hiatus.